IceRocket, a blog search engine that gets mentioned less and less in the blog search discussions, has begun to offer a new blog metrics feature which might attract bloggers back. Similar to BlogBeat, which was acquired by FeedBurner, IceRocket is offering blog metrics. 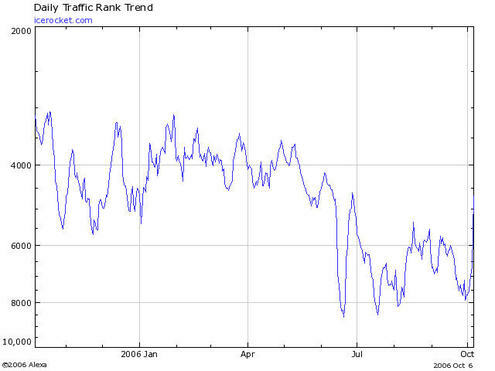 Offering bloggers metrics might help IceRocket to reverse the downward decline in traffic over the past year (shown below). I recall almost two years ago IceRocket was a rising star along side Technorati in a very open blog search race. Technorati has continued to grow and companies like Sphere have been created and stolen some of the spotlight. I remember getting lots of referals from people finding my content via IceRocket blog search and have mentioned IceRocket a number of times on Somewhat Frank. What happened to IceRocket? It will be interesting to see if IceRocket can use the metrics feature to delieve blogosphere reporting on the state of the IceRocket tracked blogosphere. Or is too late to stop IceRocket's downward traffic spiral?